Cucumber (Cucumis sativus) and oriental pickling melon (Cucumis melo var. conomon) are important cucurbits grown in Kerala. Cucumber is mainly used as a salad crop, whereas oriental pickling melon is largely used after cooking. Cucumber and oriental pickling melon require a minimum temperature of 18oC during early growth, but optimal temperatures are in the range of 24–27oC. The crops can tolerate low temperatures, but extreme cool temperatures will retard growth. The plants are adapted to different rainfall conditions and can tolerate a wide range of soil but prefer a well-drained sandy loam soil rich in organic matter. The optimum soil pH is 6.0–6.7, but plants tolerate alkaline soils up to pH 8.0. 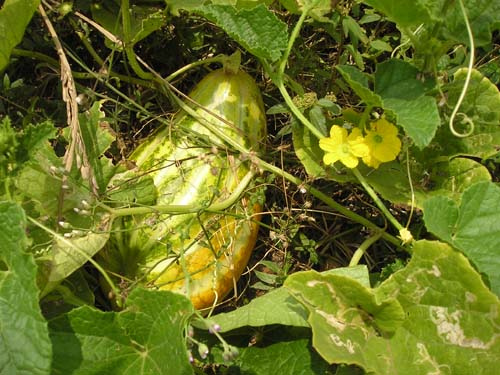 Mudicode, Arunima and Saubhagya are high yielding varieties of oriental pickling melon. Cucumber varieties such as Pusa Seethal, Poinsette, Poona Khira are exclusively used for salad purpose. Approximately 0.5-0.75 kg of seeds are required for cultivating one hectare of land. January-March and September-December are the ideal seasons for growing oriental pickling melon and cucumber. Prepare the soil to a fine tilth by ploughing and harrowing. Pits of 60 cm diameter and 30-45 cm depth are taken at a spacing of 2 m x 1.5 m. Well rotten FYM and fertilizers are mixed with topsoil in the pit. The seeds are soaked in water for 24 hours prior to planting for better and quicker germination. Soaking seeds in a solution of 0.2 % bavistin for two hours reduces the attack of soil born fungus. A pre-sowing irrigation 3-4 days before sowing is beneficial. Sow four or five seeds in a pit at 1-2 cm depth. Avoid deeper sowing as it delays germination. Daily irrigate with a rose can. The seeds germinate in about 4-5 days. Unhealthy plants are removed after two weeks and only 3 plants are retained per pit. For trailing cucumber and melon, spread dried twigs on the ground. To improve yield, remove lateral branches until the runner reaches the top of the trellis. Leave 4-6 laterals and cut the tip of the main runner to induce early cropping. Removal of lat­eral branches in the first 10 nodes has a positive effect on total yield. Apply FYM @ 20-25 t/ha as basal dose along with half dose of N (35 kg) and full dose of P2O5 (25 kg) and K2O (25 kg/ha). The remaining dose of N (35 kg) can be applied in two equal split doses at the time of vining and at the time of full blooming. A fertilizer dose of 70:25:25 kg N:P2O5:K2O /ha in several splits is recommended in Onattukara region. The fertilizer dose per pit would be 28:10:10 g N:P2O5:K2O. During the initial stages of growth, irrigate at 3-4 days interval, and alternate days during flowering/fruiting. Furrow irrigation is the ideal method of irrigating. But in water limited envi­ronment, trickle or drip irrigation can be resorted to. Cucumber and oriental pickling melon are cross pollinated crops; insects, especially bees being the main pollinators. Pollination can be a problem dur­ing the wet season since bees are less active dur­ing overcast conditions. Intro­duction of beehives ensures good pollination and avoid the need for hand pollination. Spraying vines with flowering hormones after they have six to eight true leaves will increase the number of female flowers and can double the num­ber of fruits. For example, one application of gibberellic acid at 25-100 ppm increases female flow­ers by 50 % and can work for up to 80 days. 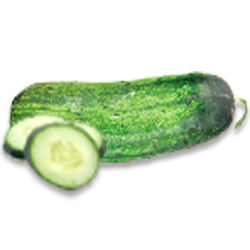 Application of ethrel (an ethylene releasing compound) has been found to increase femaleness in Cucumber and oriental pickling. Conduct weeding and raking of the soil at the time of fertilizer application. Earthing up is done during rainy season. Hand or hoe weeding can be performed as needed. Mulching is commonly used for cucumber and oriental pickling melon crops grown on raised beds. Use organic or plastic mulch depending on availability. Mulch can be laid down before or after trans­planting and after sowing. Fruit fly is the most destructive insect pest of pumpkin. 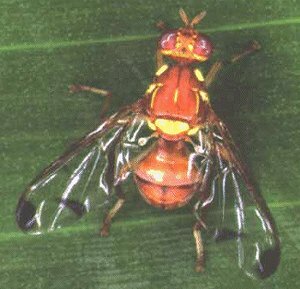 Fruit fly maggots feed on the internal tissues of the fruit causing premature fruit drop and also yellowing and rotting of the affected fruits. This fly is difficult to control because its maggots feed inside the fruits, protected from direct contact with insecticides. Control: Apply carbaryl 10% DP in pits before sowing of seeds to destroy the pupae. Bury any infested fruits to prevent the build up of fruit fly population. In homestead gardens, covering the fruits in polythene/paper covers help to prevent flies from laying eggs inside the fruits. Breaking of soil to expose pupae, and burning the soil in pit by dried leaves are also effective. It can also be effectively controlled by the use of banana fruit traps. Control: Remove and destroy egg masses, grubs and adults occurring on leaves. Spray carbaryl 0.2%. Control: Incorporate carbaryl 10% DP in pits before sowing the seeds to destroy grubs and pupae. Control: Follow complete removal and destruction of the affected leaves. Spray 10 % solution of neem or kiriyath preparation. If the disease incidence is severe spraying mancozeb 0.2% will be useful. The disease appears as small, round, whitish spots on leaves and stems. The spots enlarge and coalesce rapidly and white powdery mass appears on the upper leaf surface. Heavily infected leaves become yellow, and later become dry and brown. Extensive premature defoliation of the older leaves will result in yield reduction. Mosaic disease is characterized by vein clearing and chlorosis of leaves. The yellow network of veins is very conspicuous and veins and veinlets are thickened. Growths of plants infected in the early stages remain stunted and yield of the plant get severely reduced. White fly (Bemisia tabaci) is the natural vector of this virus. Control: Control the vectors by spraying dimethoate 0.05%. Uprooting and destruction of affected plants and collateral hosts should be done. The right time for harvest of cucumber and oriental pickling melon depends on the purpose for which the fruits are being used. 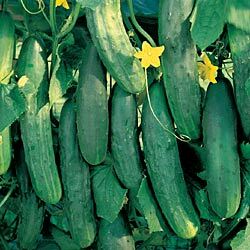 Pickling and salad cucumbers are harvested immature, while for vegetable purpose, fully mature fruits are to be harvested. Harvesting for fresh market is a repetitive process and should be done daily or on alternate days. Allowing the old fruits to remain on the vine will decrease young fruit production. Harvest the fruits by twisting with hands and are snapped off of the vine, as pulling can damage the vine. The average yield varies between 10-15 t/ha. The harvested fruits should be washed and cleaned before storing. Avoid any bruising and crushing as it reduces the keeping quality. Optimum temperatures for storage of the fruits are between 10-12°C with 95% relative humidity. Under these conditions, the fruit can be held for 10-14 days. The fruits should not be held at temperatures below 8°C as it leads to chilling injury, which manifests in the form of water soaked spots and pitting, followed by decay. Storing cucumbers with other fruits that give off ethylene will accelerate yellowing in cucumber. If the fruits are stored at 5% oxygen in a controlled atmosphere it will slow down yellowing.